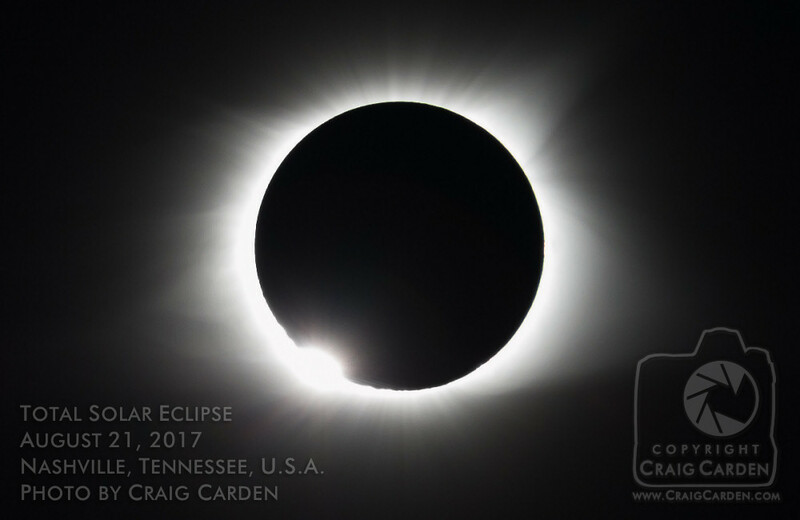 Like so many others across the United States, we couldn't resist the opportunity to view and photograph the Total Solar Eclipse on August 21, 2017. We chose an elevated spot atop an office building near Nashville's Centennial Park, and waited for daylight to go dark. We were not disappointed! An animated assembly of just over 100 shots, yielding a drastically sped-up view of the eclipse. Three-plus hours reduced to 10 seconds; Still amazing! I would be remiss if I did not acknowledge the work of the man known as "Mr. Eclipse," Fred Espenak, not only for showing the world what is possible to capture during these events, but freely offering a wealth of technical advice and guidance for those who wish to do so themselves. I have waited most of my life just to see a total eclipse, never mind giving any thought to photographing one. To have been able to achieve the results I did on a first attempt is due in no small part to Mr. Espenak's generously sharing his expertise with anyone who wishes to read it. If you have any interest in photographing eclipses, or astrophotography in general, I highly recommend his website, MrEclipse.com. After all, 2024 isn't that far away! I would also like to thank my partner-in-photo (and life), my wife, Carrie. It's a rare gift for a creative person to have someone in his life who hears the phrase, "I have an idea..." and meets it not with the question, "What's gotten into you now?" but instead, "What do you have in mind?" Few would readily accept the notion that a road trip to an atomic testing site counts as a "vacation" (it does! ), or agreeably sit outside for hours in a hot Southern summer, waiting for celestial bodies to cross paths. I'm immensely grateful that our own paths crossed as well.